The perfect protein snack. The cake batter flavor and crunch of gluten free granola is out of this world! One of the best homemade protein snacks you will ever try, guaranteed! In a food processor, grind cashew meal, granola, and protein powder into a fine powder (the granola should be broken down quite a bit from itâ€™s original size). Add the rest of the ingredients until well blended. If your mixture is still too dry to form into a ball-shape, add a bit more maple syrup. Roll into ping pong-size balls (about 1-inch). 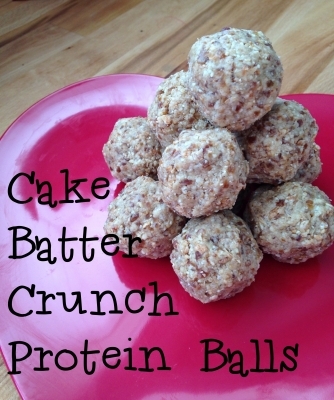 Makes about 20 protein balls. Store in an air-tight container.